With some of the best loved musical gems in theatre including ‘It’s The Hard Knock Life,’ ‘Maybe and ‘Tomorrow,’ it’s hard to imagine why Toronto has gone without Annie for so many painful years. Add in ‘Little Girls’ and ‘You’re Never Fully Dressed Without A Smile’ and it’s easy to see why playgoers have been frowning forever and a day. This is, after all, London’s 40th Anniversary West End production upon us and the unforgettable rags-to-riches story set in an orphanage during the Great Depression unfolds with the title character (played by the vocally impressive Isobel Khan) as a poor orphan living under the watchful eye of Miss Hannigan (Lesley Nicol). That’s all about to change during this particular Christmas when billionaire Oliver Warbucks hand picks the sprightly 11-year old for a holiday visit. Quickly captivated by Annie, he’s oblivious that the cold hearted Miss Hannigan and her untrustworthy friends are having none of it. 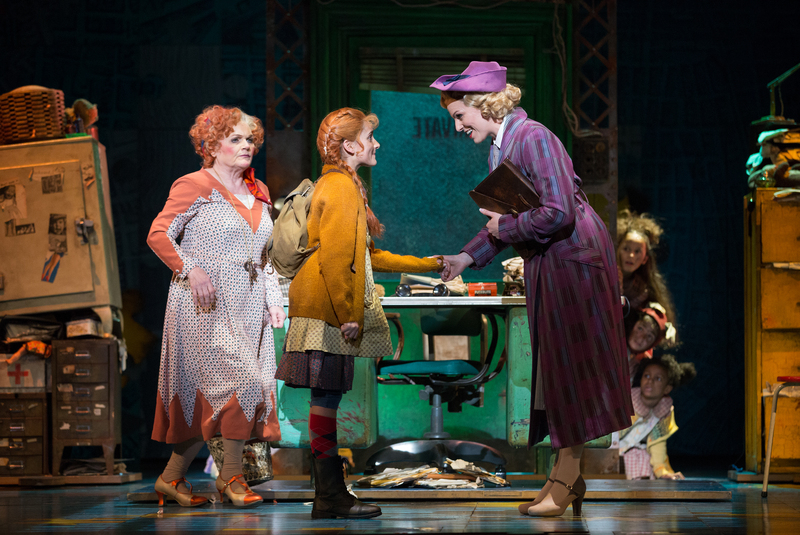 And off party-poopers go to ensure Annie doesn’t cash in a single penny from the the Warbucks’ fortune. Upbeat dance numbers choreographed by Nick Winston and a strong, punchy orchestra guided by George Dyer is accompanied with bright lighting reminiscent of Times Square of yesterday. The stunning set featured a jigsaw design, with flashes of a Manhattan map – a metaphor for how faultless Annie is trying to put the pieces of her life together to make her complete, just as America was trying to put itself back together again under the command of president Roosevelt. Overall this was an excellent, well-balanced performance that was a refreshing change from the 1982 movie and which offered a stark reminder to us all that when we’re having a day that’s grey and lonely, we should remember that tomorrow is only a day away.